This review has been printed in the September 2017 issue of Chess Life. A penultimate (and unedited) version of the review is reproduced here. Minor differences may exist between this and the printed version. My thanks to the good folks at Chess Life for allowing me to do so. Bologan, Victor. Bologan’s King’s Indian: A Modern Repertoire for Black. Alkmaar: New in Chess, 2017. ISBN 978-9056917203. PB 448pp. Kotronias, Vassilios. Kotronias on the King’s Indian 1: Fianchetto Systems. Glasgow: Quality Chess, 2013. ISBN 978-1906552503. PB 680pp. Kotronias, Vassilios. Kotronias on the King’s Indian 2: Mar del Plata I. Glasgow: Quality Chess, 2015. ISBN 978-1907982873. PB 320pp. Kotronias, Vassilios. Kotronias on the King’s Indian 3: Mar del Plata II. Glasgow: Quality Chess, 2015. ISBN 978-1907982538. PB 280pp. Kotronias, Vassilios. Kotronias on the King’s Indian 4: Classical Systems. Glasgow: Quality Chess, 2016. ISBN 978-1784830199. PB 464pp. Kotronias, Vassilios. Kotronias on the King’s Indian 5: Sämisch and the Rest. Glasgow: Quality Chess, 2017. ISBN 978-1784830359. PB 560pp. Pavlovic, Milos. New Weapons In the King’s Indian. Gent: Thinkers Publishing, 2017. ISBN 978-9492510020. PB 242pp. I have noticed that a lot of amateur defenders of the King’s Indian (KID) tend to ‘wing it’ in the opening. They trust that their general knowledge of the KID will suffice as they fling their pawns and pieces forward, or that the Muse will grace them with the right move just when they need it. What they forget is that even Kasparov – one of the most dynamic players in chess history, and one of the KID’s greatest champions – had to marry inspiration with theory, memorizing variation after variation as he tried to survive his theoretical arms races with Karpov and Kramnik. Eventually he gave up, deciding that the memory work required to play both the Najdorf and the KID was too much, and that the Najdorf was a better use of his time. It is absolutely critical to know your theory if you want to play the KID, particularly at the master level or in correspondence play. And chess publishers have come to the rescue, with a slew of recent titles that cover the main lines, the side lines, and everything in between. We’ll take a look at seven books by three authors this month, using two examples to help illustrate the strengths and weaknesses of each author’s project. The fifth and final volume of Vasilios Kotronias’ epic series on the KID is newly published by Quality Chess. Clocking in at over 2300 pages, these five volumes – Kotronias on the King’s Indian 1: Fianchetto Systems (2013), 2: Mar del Plata I (2015), 3: Mar del Plata II (2015), 4: Classical Systems (2016), and 5: Sämisch and the Rest (2017) – almost certainly represent the most detailed examination of a single opening in chess history. In a clear echo of Quality Chess’ slogan, the series promotes the most central and principled of main lines in KID theory. This includes the ‘Kasparov’ line against the Fianchetto (v1) featuring ..Nbd7, ..e5, and ..Qb6, the famous Mar del Plata variation in the Classical (v2 and v3), and the super-topical 6. ..c5 against the Sämisch (v5). While the vast majority of the lines discussed in the early volumes still stand up – current top-level correspondence games seem to support this – Kotronias has kindly included 46 pages of updates and revisions to previous analysis in the fifth book. On the whole the repertoire is very similar to that proposed in the 2009 edition. It trends towards the main lines (Panno against the Fianchetto, the Mar del Plata, 6. ..c5 vs the Sämisch) but nearly always included multiple repertoire choices for readers to choose from. Bologan also provides suggestions against the English Opening, White’s double fianchetto, the Torre and the London. His is the only book under current discussion that does so. Our third and final book comes from Milos Pavlovic and Thinkers Publishing. New Weapons in the King’s Indian (2017) consists mainly of lesser known paths in the KID. Pavlovic analyzes the ..exd4 lines in the Classical and 6. ..Nbd7 in the Sämisch (which backs up into some 6. ..c5 variations). He eschews typical KID lines in the Fianchetto variations, instead arguing for the viability of an old pawn sac in the English Four Knights after 1.d4 Nf6 2.c4 g6 3.Nf3 Bg7 4.g3 c5 5.Bg2 cxd4 6.Nxd4 0-0 7.Nc3 Nc6 8.0-0 d6!?. Pavlovic’s book is largely raw analysis. There is, the table of contents notwithstanding, no bibliography in the book, and it can sometimes resemble a database dump a bit too much for my taste. The layout is very clear and pages have plenty of white space, but once again a Thinkers Publishing book suffers from mangled English. It is fully readable, to be sure, but the editorial lapses range from the mild to the comical. One of the best ways to try and compare opening books is to compare their common analyses. There is quite a bit of overlap in some of the main lines between Kotronias and Bologan, and some with Pavlovic. Here we’ll take a look at what they have to say about two currently theoretically important positions. The Bayonet Attack in the Classical KID remains quite trendy at all levels. After 1.d4 Nf6 2.c4 g6 3.Nc3 Bg7 4.e4 d6 5.Nf3 0–0 6.Be2 e5 7.0–0 Nc6 8.d5 Ne7 9.b4 Black has two main options: 9. ..Nh5 and 9. ..a5. Both Bologan and Kotronias analyze 9. ..Nh5, where one of White’s current thematic tries is 10.Re1 f5 11.Ng5 Nf6 12.Bf3 c6. 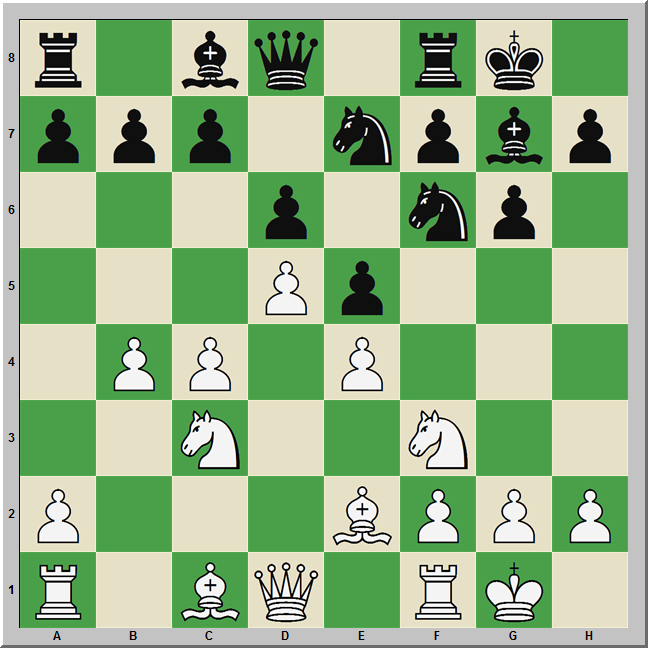 Here 13.Be3 and 13.Bb2 are White’s most common moves, but 13.dxc6!? is a rare move played by Vishy Anand’s long-time second Radoslaw Wojtaszek. After 13. 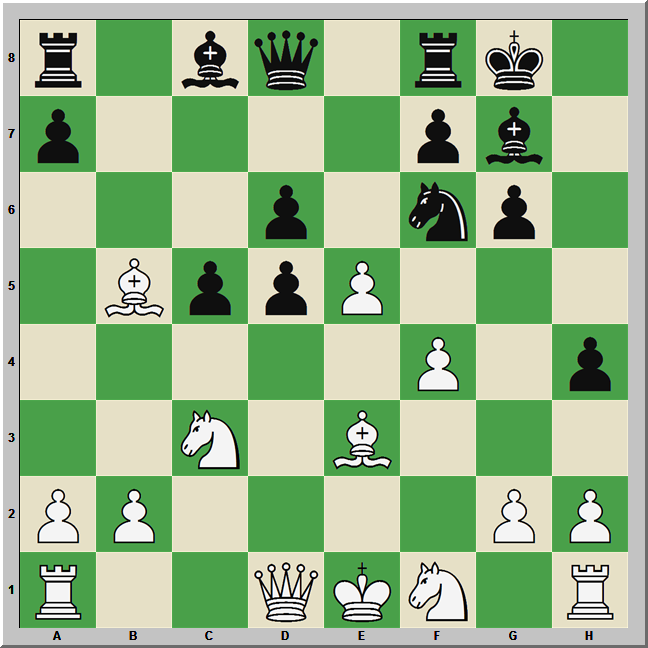 ..bxc6 14.exf5 gxf5 15.b5 White has given up the center, but has some tactical possibilities in exchange. Kotronias devotes a full chapter to this variation, claiming that Black can ‘hold his own’ after 15. ..h6 16.Nh3 d5 17.bxc6!? e4 18.Ba3 d4 and 17.Ba3 e4 18.cxd5 cxd5 19.Nf4 Re8, with analysis running out to move 49! 13.dxc6 does not appear in Bologan’s book, but he does (briefly) discuss the alternative 12. ..h6. This precludes Wojtaszek’s move and forces White back into more traditional lines with 13.Ne6 Bxe6 14.dxe6 c6 as discussed by David Vigorito in his excellent column at ChessPublishing.com. Bologan also covers 9. ..a5 and 9. ..c6 as alternatives to 9. ..Nh5. His discussion of 9. ..a5 is worth particular attention. After 10.Ba3 (10.bxa5 c5 locks up the queenside) 10. ..axb4 11.Bxb4 Nd7 12.a4 he analyzes the relatively rare 12. ..Kh8!? and shows it to be a very reasonable path for Black. Another important variation – this time in the Sämisch – comes from the famous game between Peter Svidler and Alexander Grischuk in the 2013 FIDE Candidates Tournament. After 1.d4 Nf6 2.c4 g6 3.Nc3 Bg7 4.e4 d6 5.f3 0–0 6.Be3 c5 7.Nge2 Nc6 8.d5 Ne5 9.Ng3 h5 10.Be2 h4 11.Nf1 e6 12.f4 Grischuk set the board aflame with the fantastic piece sacrifice 12. ..Nxc4!? 13.Bxc4 b5 14.Bxb5 exd5 15.e5. All three books include this position as part of their repertoires, although Pavlovic reaches it by means of a slightly different move order (6. ..Nbd7 7.Nge2 c5 8.d5 Ne5, transposing). Kotronias disagrees. Citing Svetushkin, he thinks that after 21.Ne3 “White had the more pleasant position… Black had a nominal material advantage with a queen and a rook against four minor pieces, but the pieces coordinate beautifully.” (476) I suspect that he might be right here, at least in terms of practical play. There are four over-the-board games with 15. ..Bg4 in my database, and after 16.exf6 White won all of them. This is, by necessity, a small analytical sampling, but these examples help to illustrate some of the relative strengths and weakness of our authors and their books. Kotronias’ books are astoundingly detailed, scrupulously sourced, and analytically precise. It is hard to think that they could be bettered in accuracy or coverage. At 2300 pages, no one – not even Kasparov – could hope to memorize it all, so I suggest that readers focus on the skeleton of beginning of each chapter and the summaries at their ends. Fill in details as interest, practice and time allow. Bologan’s book has two main strengths. It is concise, and it offers multiple repertoire choices when Kotronias tends to offer just one. That it covers ‘sidelines’ like the English, London or Torre is also very useful. Bologan’s analysis is generally of a high standard, but readers should pay special critical attention to pages that lack game citations after 2009. I am less enthusiastic about Pavlovic’s book. I don’t trust his evaluation of 15. ..Bg4 as described above, and as I checked his analysis, both of Svidler-Grischuk and more broadly, I kept finding small problems. I think the book can be useful for those looking for lesser-traveled paths in the KID or for those whose repertoire matches up with his choices, but it’s just not in the same league as Bologan or Kotronias. This entry was posted in Openings and tagged Bologan, Bologan's King's Indian, Kotronias, Kotronias King's Indian, Kotronias on the King's Indian, Milos Pavlovic, Pavlovic King's Indian, Vassilios Kotronias, Victor Bologan on September 4, 2017 by fullcityplus.